The best way to understand any functionality is to build a simple demo application. Let’s create a demo app that allows username1 to make a video call to username2 and, during the call, users can share their screen with one another. The demo app has three video blocks: the first one is for your own video stream, the second one is for the incoming video stream and the third one is for viewing locally what is being shared. To simplify the process, we will use our video chat demo as a boilerplate. You can follow the link and copy whatever piece of code you want. So let’s do it! Screen Sharing is available via VoxImplant WEB SDK only [at the moment]. The participant who starts sharing the screen (the initiator) should use Chrome or Firefox. We recommend using the latest browser versions. IMPORTANT: if the initiator uses Chrome, a special screen-sharing extension must be installed. IMPORTANT: You should load your application over HTTPS (it also applies to localhost and dev environment). You won’t be able to share your screen in the apps loaded over HTTP, you will only be able to view the other participant. Since Google Chrome implemented the native support of screen sharing in the 72 version, this step is not actual anymore. Though, you can explore the step if you're curious. To use Screen Sharing in Chrome, you need to add a special extension. Go to the folder with the Chrome extension. Open the manifest.json file and add your website to the matches section. Then, in the address bar on a new tab, type chrome://extensions to open the Extensions page. Select the Developer mode check box to enable loading extensions from a folder. Finally, click Load unpacked extension or drag the folder with extension onto the page to load the extension. The new extension will be displayed on the page. IMPORTANT: If you want to change manifest.json again (for example, add another test server), you should also change the version parameter, namely increase its value. Then remove the extension from Chrome and add it again. Great! Now you have a developer version of the extension for debugging and experimenting. However, your future users won’t be happy to install the extension in such a way. That’s why you should publish your extension in Google Web Store. For details, see the official documentation. 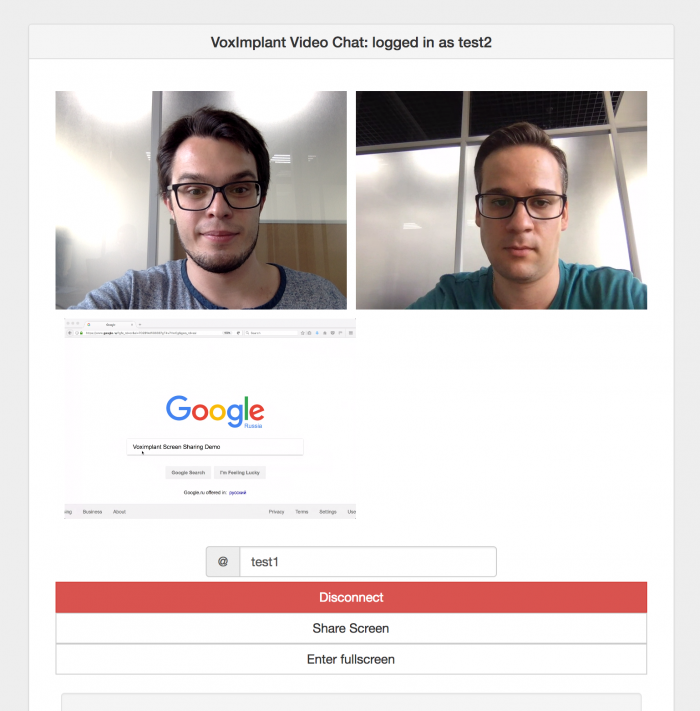 First and foremost, you need to create a new VoxImplant application called videochat at https://manage.voximplant.com/applications, its full name will look like videochat.youraccountname.voximplant.com. That’s it, really! It’s just one smart helper function that will handle all the operations to connect two users. 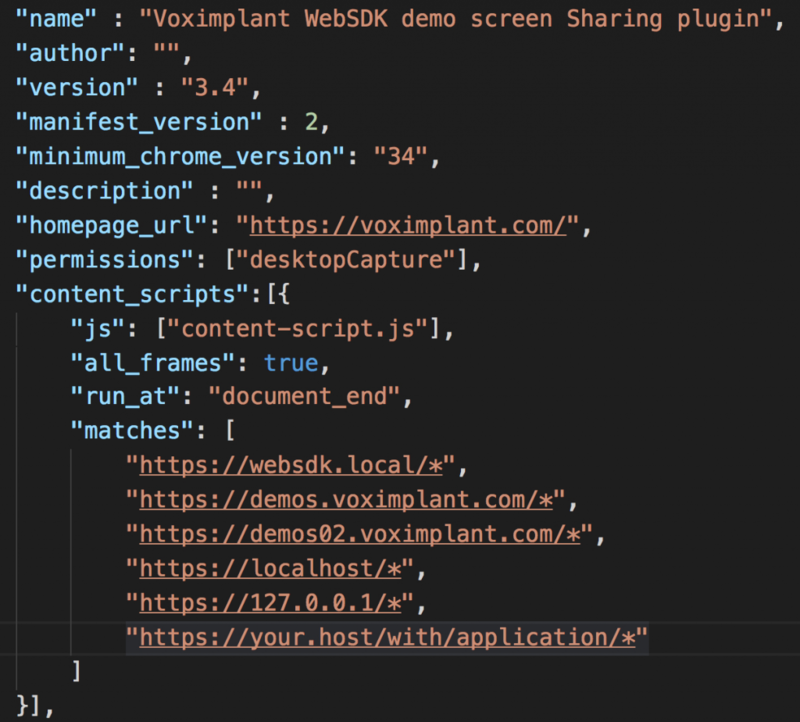 Now you should create a new rule in your VoxImplant application using the new scenario. Go to the Routing tab of the application, name a new rule as intercom and leave the call pattern as default ( . * ). Note that the application should have at least two active users, for example, username1 and username2. You can create them in the Users tab of the application. Note that in HTML we use two local CSS files have been mounted: css/bootstrap-dialog.css and css/app.css. We’ve added them to make the application more user friendly. You can copy their content from the repository. Then start writing the JS code for the application. See the key pieces of code below, they are pretty important. The wholelisting is available at the GitHub repository. Do you remember the username(s), application name and passwords from paragraph one? You will definitely need them to use the application. We need to add two buttons to turn ScreenSharing on/off and then make them work. So, add the handlers with the shareScreen() and stopSharingScreen() methods to the corresponding buttons, that’s it. Note that calling shareScreen(true) allows the initiator to view what is being shared. Now you could check the whole demo app code here. Bear in mind that you should insert your own values (see paragraphs 2 and 4.3). Open your awesome demo app on two different devices. Allow access to your microphone and camera. In demo app 1 where you’re logged as username1, type username2 in the @Username field, then press Call. Wait a little while the video call is being established. When the video stream starts, you can click Share Screen. Then a window will open in your browser prompting you to choose which screen/window you want to share. Choose the screen/window and click Share. The other participant will see your screen/window. You will also be able to see what you are sharing at the moment. To stop sharing the screen, click Stop Sharing. The screen sharing will stop immediately.